Joe Adinolfi, an off-duty firefighter, rescued nine people from 5 feet floodwaters and a raging fire when Hurricane Sandy struck his tiny seaside community of Breezy Point, N.Y., on Monday night. 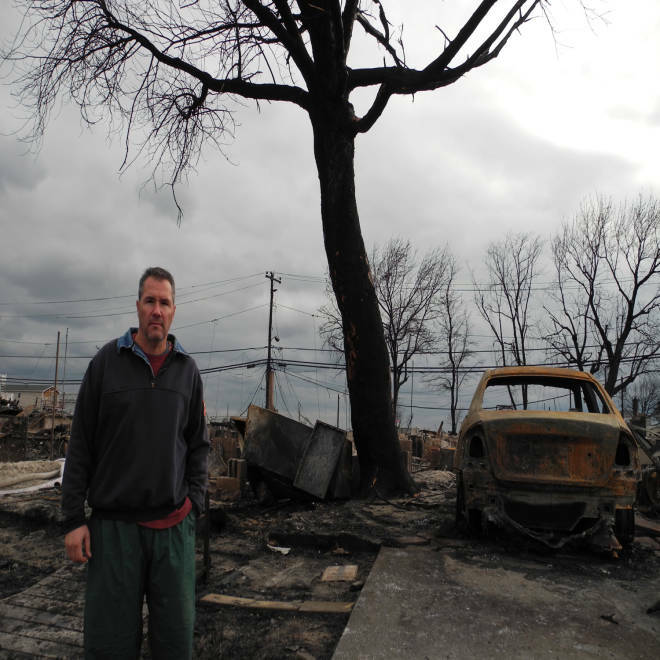 BREEZY POINT, N.Y. -- A raging fire was creeping closer and closer to Joe Adinolfi’s home when he decided to get out. He packed his phone and wallet into a life vest, since there was also about 5 feet of standing water outside his home due to Hurricane Sandy, and thought he would try to reach a refuge within his tiny seaside community of Breezy Point in New York City. But then he heard a cry for help from the parking lot in front of his home. “I heard people out there in the parking I couldn’t see calling for help, and when I got over there, closer, I saw it was these elderly women,” said Adinolfi, a father of three girls who was off-duty from his work as a firefighter that Monday night when the storm struck. Adinolfi, 48, waded into the waist-high water around 10 p.m. where he found three women clutching onto the back of a SUV, one holding so tightly onto a kennel with several small dogs that her hands were bleeding. The women also had an African Grey Parrot. Adinolfi took the cages and led the women back to his home. The dogs bit at his left hand – and he has the bite marks to prove it. 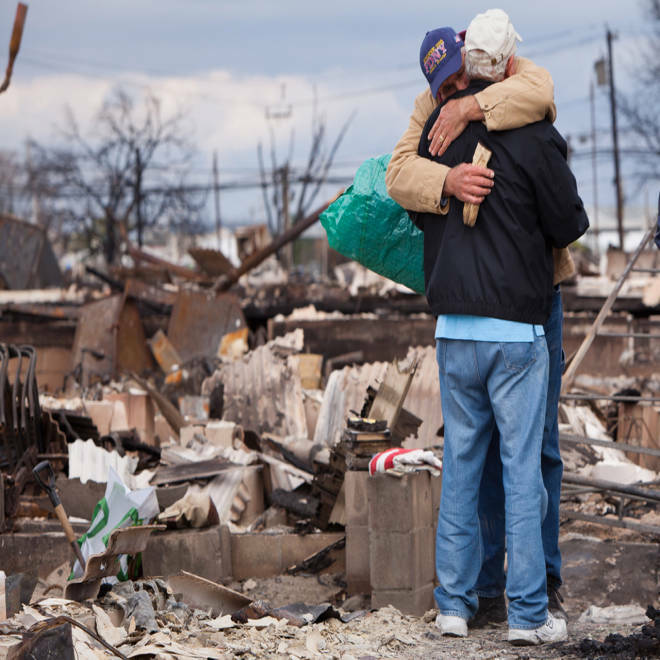 Sandy's destruction raises question: What is irreplaceable? “You had to see the dogs and I was carrying that thing, they were like half underwater swimming in this cage. But we got’em all out,” he quipped. The rescue didn’t end there: One of the women told him about her autistic brother, who was clinging to a nearby fence with his Spanish-speaking aide standing in the water. Next to them, there was a mother with her two adult daughters and one of the girl’s boyfriends. Adinolfi made trips back and forth for about an hour through the ocean water, which he recalled thinking felt warmer than he thought it would. The group dried off at his house and hunkered down there for two hours. One of the women with her mother, Joanne Lepera, said the elderly women were somber, devastated that their homes had been lost to the fire. As the fire raged closer to Adinolfi’s two-story home, the group left for another friend’s house. He eventually left them and went to another home, where he stayed the night. Adinolfi modestly recounted the tale on Thursday as he walked through his devastated community, saying, “that was it, that’s my story.” He also chided himself for staying back after his family left, noting it was “foolish.” He had done so to try and prevent flooding in his home, though his basement ultimately filled up with water. As he passed his neighbors with a reporter, they called him a hero. He lightheartedly brushed that off, though Lepera said he deserved the moniker. She said that when Adinolfi came by waving a flashlight, he told them that he was a firefighter and that their house could be under threat from the blaze since the wind was shifting. The storm delivered two punishing blows to this community founded more than a century ago by Irish immigrants. First it sent floodwaters roaring through its streets and into its homes, then sparked an inferno that claimed more than 100 houses -- including the Lepera home -- nestled side-by-side on tiny lanes of sand. At the parking lot where Adinolfi made the rescues, one car bore the water marks of being almost completely submerged. There also remained the white SUV the elderly women clung to. But Adinolfi insisted he wasn’t a hero.